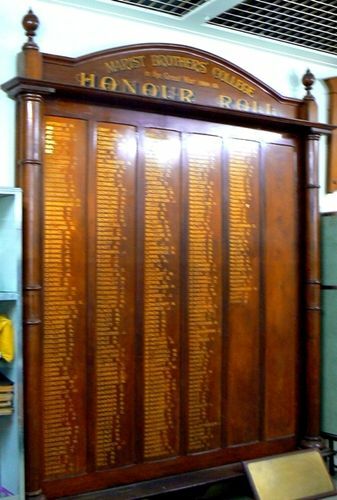 The Honour Roll commemorates ex-students of the College who served in World War One. Bendigo. Visit of Archbishops. Archbishop Cattaneo, the Papal Delegate, on Sunday afternoon officially opened the new High School erected in connection with the Marist Brothers' Catholic College, Bridge street. There was an enormous attendance. Subsequently Dr Mannix delivered a long address to 5000 people in unveiling an honor roll at the Marist Brothers' College. The roll contained 340 names, eight of whom had won Military Medals or other decorations. Ballarat Star (Vic), 8 April 1918.